The Checkout nominated for the APRA Screen Music Awards! I’m completely thrilled that I’ve received my first nomination for an APRA Award – for Best Televsion Theme for the music for The Checkout. There’s a fantastic line-up of composers in contention in all categories, so it’s going to be an honour just to be at the ceremony on December 9. I was recently privileged and very happy to be involved with a project that seeks to bring compassion to the public debate around asylum seekers in Australia. I produced a track for a group of talented, committed and passionate members of the Uniting Church who had put together a new version of the gospel standard “Where You There When They Crucified My Lord?”, featuring the powerhouse vocal talents of Charissa Suli. This is the official music video that was made to launch the broader Give Hope campaign – uniting for asylum seekers, a project from the Uniting Church’s social justice arm Uniting Care. You can find out more about the campaign here. ABC TV is back in the business of consumer affairs with a new satirical show, The Checkout. I had the chance earlier this year to do the music for it – a pacey, cheeky, retro-futurist re-branding; a new approach to the genre for a new generation of consumers. Featuring Craig Reucassel and Julian Morrow (The Hamster Wheel, The Chaser’s War on Everything), Kirsten Drysdale (Hungry Beast) and Kate Browne from consumer group CHOICE, The Checkout offers unhappy customers a revolutionary new wonder diet of information and entertainment that’s clinically proven and 70% fat free. Conditions apply. Check it out on ABC1 Thursdays at 8pm, or catch up with it on the ABC’s iView. 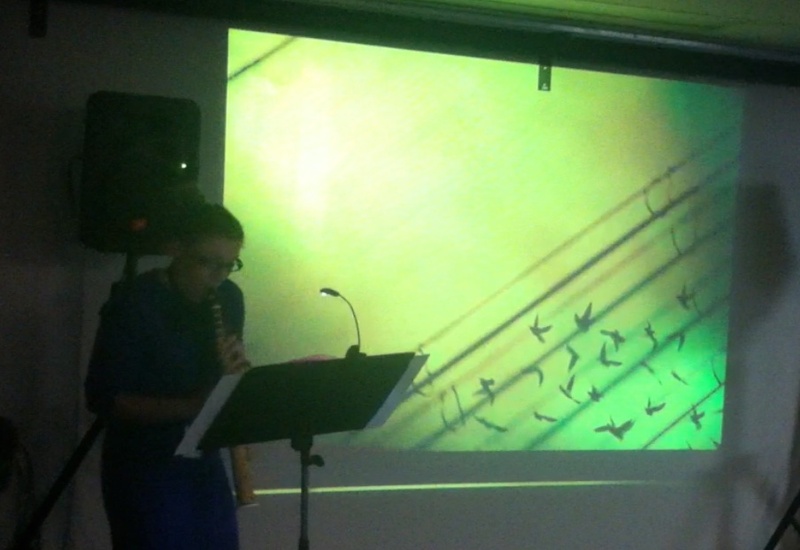 A few weeks ago on one her whirlwind trips to Sydney, Nicole Canham premiered my new piece Time Flies When You’re Having Fun for tàrogatò and electronics at the Australian Institute of Music in the Composition Seminar there. Nicole commissioned it as both a standalone piece, as well as being a part of her larger, immersive multimedia work Hourglass which is being premiered in Mexico City in two sold-out performances this weekend. For Hourglass, Nicole commissioned a range of composers and video artists from Australia and Mexico (you can see in the image above the work of Australian Sarah Kaur) in putting together this exploration of our experiences of time – I also got to produce and mix a recording of Without Time, the gorgeous piece by Elena Kats-Chernin for multilayered clarinet that’s also featured in the program. My little bit of Hourglass was partly inspired by a review I read of the work of video artist Pipilotti Rist in the The New Yorker where art critic Peter Schjeldahl wrote that “Her pop cultural affinities don’t unite high and low so much as make them seem like interchangeable engines of pleasure.” I liked this description so much – and it chimed so well with the way I think about and work with music – it became a kind of manifesto for the piece, and prompted the title as I began to discuss the themes of the Hourglass project with Nicole. I tried to keep my approach to the work playful and joyous, taking samples from recordings of Nicole playing the tárogató to make all of the sounds in the electronic part, and imagining Nicole dancing as she played the live part, lost in a state of ‘flow’. It’s been a very busy few months – lots of it having little to do with music, what with relocating my home and studio to Newtown, a veritable tree-change after the very authentic grit & grime of Surry Hills where I’ve lived & worked for the past 11 years. So a very big move, even if it’s only a few kilometers as the crow flies. For all the stress of the transition I’m very happy in my new digs, as are my plants – we now have a back garden area with access to sunlight all day, natural rainfall, and a hose. 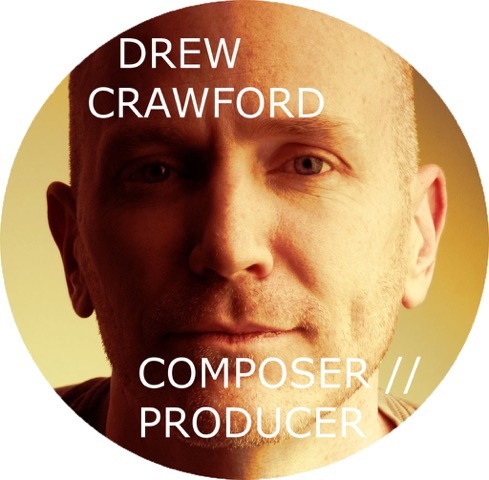 How I got around to working on the new MA tracks or uploading so much audio to the Listen section of this site staggers me (there’s also a sneak preview in the Chopin Project 2010 section). In amongst all of this the My Mutation competition came to it’s delightful conclusion on Sunday 26th September with the announcement of the winner Sarah McCreanor from Brisbane, who came down to dance on the Opera House Forecourt with a very talented troupe of volunteers all choreographed by Kate Champion. Kate’s concept of a sudden, surprise start to the competition’s grand finale dance that would feel like a flash-mob performance was really terrific – the crowd, myself included, was completely taken in and when the dancing started it was exhilarating. There was a Footloose dance class happening on the stage, getting the audience warmed up for a screening of the film later in the evening, and it was interrupted by these killjoy security guards who started moving people off the stage, getting boos from the crowd. But then…. You can now see the whole sequence on YouTube – there’s a video diary thing by Sarah at the start but the dancing gets going at around the 6 minute mark (though it’s worth watching earlier for the dance class footage – everyone was really good!). 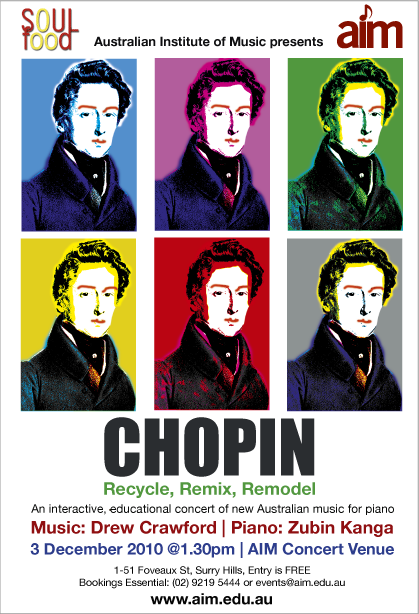 And in other news, it looks like we have a date for the premiere of the Chopin Project Piano Suite (still untitled, unfortunately): December 3, 2010 at 1.30pm, just scraping into this momentous 200th anniversary year. It’s going to be presented by the Australian Institute of Music where I teach, and it will be put on free for HSC students from around the city, followed by a mini-lecture from me about how the works were written and how they might go about using those techniques in their HSC works. Zubin is back in London, madly learning them as I type, and in truth I’m rather looking forward to hearing him play them. I’ve gotten so used to the MIDI version I imagine it will be quite disorienting when I first hear them, but I’m hoping hoping it will be a pleasant kind of disorientation. For those interested in attending, let me know – there’ll be some room for GP so get in touch if you’d like to come.